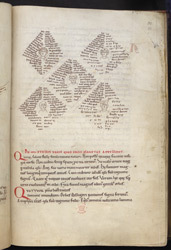 The 16th-century English bibliophile, Robert Cotton, sometimes bound together separate manuscripts which were otherwise unrelated, creating books of miscellaneous contents, this book being a good example.It is made of a fragment of an early 12th-century English scientific textbook from Peterborough and an 11th-century pontifical (manual of services conducted by a bishop), part of which was probably made in France but to which additions were made at Sherborne Abbey in Dorset. The page shown comes from the scientific textbook which itself comes from two types of sources. One is the 'natural science' tradition of the early middle ages which began in the treatises of Isidore of Seville and Bede, later expanded by Abbo of Fleury, who lived at Ramsey in the 10th century. The second part is a copy of a late Roman version of Cicero's latin translation of the poem by the Greek writer Aratus on the constellations, known as the 'Aratea' and which probably had a long tradition of illustration. It would have been a textbook for monks and churchmen. Annals in another fragment of the book (also in the British Library) giving the death dates of Peterborough abbots and the handwriting's similarity to that of the Peterborough Chronicle (at the Bodleian Library, Oxford) place the manuscript's origin at that monastery. Only five planets plus the Sun and Moon were known in the Middle Ages, before the invention of the telescope: Mercury, Venus, Mars, Jupiter and Saturn. The seven days of the week were named after them. The rubric reads 'Concerning the seven wandering stars, which the Greeks call planets'. The Greek word 'planetes', meaning wanderer, refers to the fact that the planets could be observed to move relative to the other stars: they wandered rather than following the course of the stars. They are represented here as the gods after whom they were named, with helmeted Mars in the centre, and clockwise from upper left, Jupiter, Saturn, Venus, Mercury. The identifying inscriptions around the pictures were not part of the original poem but were a later addition to Cicero's translation which was always written within the illustrations.